Cast on 54. Join to knit in the round. Divide stitches with 18 stitches each on three double pointed needles or 27 stitches each side for a magic loop. Repeat the round directions across the round. 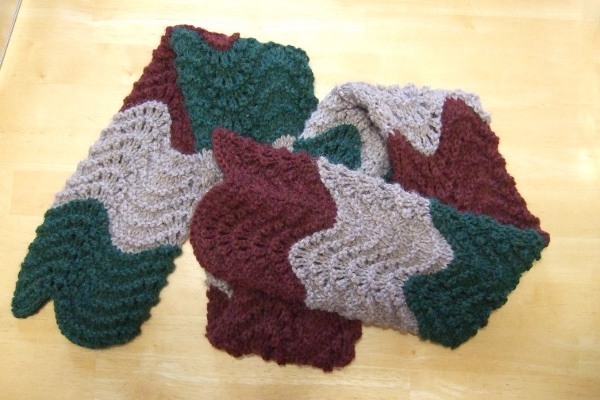 Repeat rounds 1 – 4 until the scarf measures 60″ or desired length. Cast off with a rnd 4. Weave in ends. The scarf can be made in a solid color. If desired, color changes can be made between repeats. Example has color changes every six repeats. Beautiful .. thanks for the pattern. You share your beautiful patterns with us and “I thank you”. Now, I would like to share something from my experience of making many shawls/lapghans for nursing homes. I always add a pocket or two (sewn on separately) for tissues, etc. Because lapghans tend to slip, I add a removable cord on each side that can be tied to arms of chair, if needed. And, don’t forget the men! Make some in manly colors. If you make a shawl big enough, it can be an afghan. Women get cold shoulders, men get cold legs and feet. These ideas came from the recipients. Hope they help. Thanks again for a great site!! Feather and Fan is the pattern my mom used to make a sweet carriage blanket when my son was on the way, 43 years ago. Now I have a name for it, and the pattern too. Thanks so much for your excellent site. I love the look of this scarf. Do you have the pattern using the straight needles? I would really appreciate it as I do not know how to use dbl ptd needles. Thank you!!! You can make this on straight needles by not joining and purling the row 2’s and knitting the row 4’s. If you like the tube look, just seam the side when you are done.